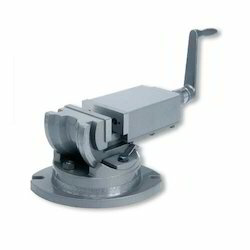 - Vise Body made of High tensile closed grain Cast Iron. - Steel Jaw Plates are ground and Hardened to 50-60 HRC. - Base can be Swiveled through 360° and Vise tilted through 90°. - Vise can be locked positively at various compound angles. With three machined sides. The slot fits the adjustable fence of the drill stand MB 140/S and bench drill TBM 220. Horizontal and vertical V-slots in jaw. Jaw width 50mm and height 10mm. Maximum clamping width 34mm. 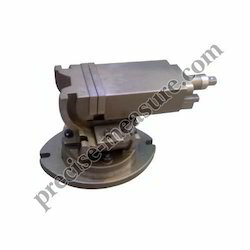 Available with us are huge range of Machine Vice. The product is procured from reliable vendors of the market who use optimum quality material for the production. Also, these are tested on several set parameters in order to serve the clients only quality-approved products.